Never stops doling out demented treats....Dahl's morality play of bad parenting and bad-egg kids is evergreen....a genuinely amazing movie. 120 min. Warner Brothers. Director: Tim Burton. Cast: Johnny Depp, Freddie Highmore, David Blake Kelly, Helena Bonham Carter, Noah Taylor. Let's start here: Charlie and the Chocolate Factory is a genuinely amazing movie. In his best film since Ed Wood, Tim Burton revisits two creative cousins: five-time star Johnny Depp and author Roald Dahl (Burton produced James and the Giant Peach in 1996). Dig deeper and you'll find an astounding creative team that's earned Burton's trust, including composer Danny Elfman, DP Philippe Rousselot, and production designer Alex McDowell. As in Dahl's 1964 novel, young Charlie Bucket (Freddie Highmore of Finding Neverland) lives in not entirely cheerless destitution with his parents and four grandparents (including David Kelly's live-wire Grandpa Joe). When reclusive chocolate factory owner Willy Wonka announces that 5 golden tickets have been packed into specially-marked Wonka bars, Wonka-mania seizes planet Earth. Though the tickets are mostly the birthright of the rich and spoiled, Charlie winds up with one and takes Grandpa Joe as his chaperone. In 1971, Gene Wilder played Wonka, in the overtly musical Willy Wonka and the Chocolate Factory (scripted but dissed by Dahl). Wilder's successor, Johnny Depp, is equally threatening, by passive aggression, and equally funny. Depp's Wonka is unnaturally pale, parent-phobic (can't even bring himself to say the word), and all-around psychotic; comparisons to Michael Jackson and his expensive Neverland play palace are inevitable. But Depp's toothy, demented CEO also evokes Bill Gates in his awkward speech and cue-card patter. He's a man high on his own invention, but he takes little pleasure in other people, excepting his poker-faced Oompa Loompas (all played, thanks to special-effects wizardry, by a hilarious Deep Roy). Wonka's guests are a pointedly rude assemblage of youngsters, and the chocolateer bristles at nearly every question he's asked. 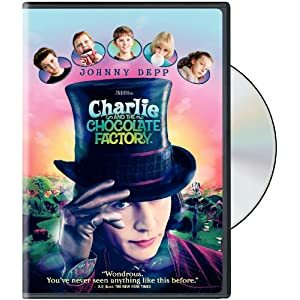 Each of Charlie's counterparts—German glutton Augustus Gloop (Philip Wiegratz), alpha-brat Veruca Salt (Julia Winter), psychotically driven gum-chewing champ Violet Beauregarde (Annasophia Robb), and precociously informed video-child Mike Teavee (Jordon Fry)—provides an opportunity for a set-piece. Every stop on Wonka's tour dispatches another troublesome brat, and the Oompa Loompas break out in a production number to sing the sins of the father, mother, and child. After the perfection of the first-act buildup, the tour introduces a less satisfying pace, but Charlie and the Chocolate Factory never stops doling out demented treats, whether they be trained squirrels or Deep Roy as an Esther Williams chorus. The Oompa Loompa tunes, with Dahl lyrics scored and sung by Elfman, are a hoot, with modern touches of disco and British Invasion pop—unfortunately, the all-important lyrics get drowned out in the mix. The casting is impeccable to a role, with Helena Bonham Carter and Noah Taylor toddling through as Mr. and Mrs. Bucket, James Fox as the aristocratic Mr. Salt, and Christopher Lee as a man from Willy Wonka's past (Geoffrey Holder—picking up the slack for the ubiquitous Morgan Freeman—narrates in plush tones). In some respects, Burton is the true star, guiding McDowell's exceptional design and Keith Phipps' art direction to dizzying heights. The story hasn't changed much, but when screenwriter John August (Big Fish) diverges from the source material for expository flashbacks, the results are richly amusing and serve the film's theme. For Charlie and the Chocolate Factory, its magic aside, plays like the anti-Harry Potter: instead of a boy aching to escape his (foster) home and hearth and replace it with another, truer family, Charlie clings to his family and remains sensibly skeptical of his new mentor. Dahl's morality play of bad parenting and bad-egg kids is evergreen, and the updating by August and Burton is rarely obtrusive. Appropriately, Mike Teevee now plays first-person shooters, while the satire of eating excess has never seemed more relevant on these shores. Patiently, Wonka explains, "Everything here is eatable. I'm eatable. But that, my children, is called cannibalism, and it is frowned upon in most societies." Then again, Charlie's clear-headed reminder that "Candy doesn't have to have a point" is as good a reason as any to run out and bulk up on Burton's gleefully childish eye-candy. 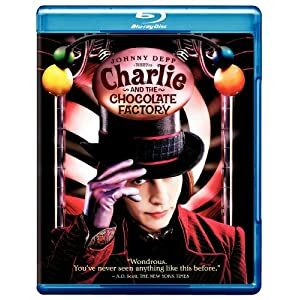 Charlie and the Chocolate Factory hit HD DVD in 2006, but its Blu-ray debut would take another five years. At last it arrives, in a special edition that—if not exactly worth the wait—will nevertheless please fans. Image quality is well up to par, with vivid colors, strong definition and detail, and palpable textures: the big winner here is depth, which handily trounces the picture's standard def counterpart. Sound comes in Dolby TrueHD 5.1, and its a lively soundscape indeed, with plenty of well-placed, loopy sound effects creating a wraparound effect and the Danny Elfman score achieving an impressive fullness. Bonus features are plentiful, all on a single BD. This time the film comes with an In-Movie Experience PIP track that includes cast and crew interviews, set footage, trivia, and other playtime fun; there's also an audio commentary with director Tim Burton, which didn't make it onto previous releases. As usual with Burton, it's a bit of a trying experience, given long gaps in the track. Only die-hards will have the patience to see (or, rather, hear) it through. The first of seven cool making-of featurettes with cast and crew interviews and behind-the-scenes footage, "Chocolate Dreams" (6:57, SD) focuses on adapting the source material. "Different Faces, Different Flavors" (10:39, SD) hones in on casting, including interviews with Johnny Depp and the young ensemble. "Designer Chocolate" (9:36, SD) allows us to spend time with production designer Alex McDowell, who takes us on a set tour. "Under the Wrapper" (6:58, SD) deals with visual and practical effects, while "Sweet Sounds" (7:17, SD) interviews composer Danny Elfman and also looks into the film's choreography. "Becoming Oompa-Loompa" (7:16, SD) profiles Deep Roy and explains how the film duplicated him in a variety of ways. Lastly, "Attack of the Squirrels" (9:49) covers, well, squirrel training. The BBC doc "Fantastic Mr. Dahl" (17:42, SD) is a terrific inclusion here, including archival footage of Dahl and interviews with intimates of the author. Rounding out the disc are "Pre-Vis Augustus Gloop Dance" (2:06, SD) and "Pre-Vis Mike Teavee Dance" (1:32, SD), a nightclub promo video here dubbed "Club Reel" (2:54, SD), and the "Theatrical Trailer" (2:26, SD). All site content © 2000-2019 Peter Canavese. Page generated at 04/25/2019 02:40:54PM.